Cracked electronics, distorted luminosities and photochemical aberrations are brought into being across four intensely unique and electrify acts. 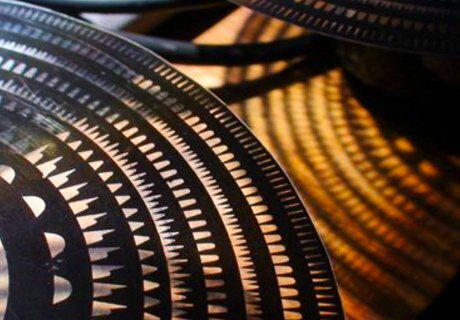 Derek Holzer unleashes opti-sonic graphic scores utilising his homemade Tonewheels technology. Hangjun Lee and Chulki Hong present a brutal expanded cinema set with 16mm film projections, optical sound and turntables. Ewa Justka performs optoelectric noise with pulsing hacked light. And Rose Kallal presents immersive 16mm film projections with live modular synthesis soundscapes. Derek Holzer is an American instrument builder and sound artist based in Berlin, whose application of DIY analogue electronics interrogates the relationship between sound + space and media archaeology, and examines the meeting points of electroacoustic, noise, improv and extreme music. Frustrated with the performance limitations of the computer, Holzer began new experiments with all-analogue systems. Tonewheels is Holzer’s experiment in converting graphical imagery to sound, inspired by some of the pioneering 20th Century electronic music inventions. Transparent tonewheels with repeating patterns are spun over light-sensitive electronic circuitry to produce sound and light pulsations and textures. This all-analogue set is performed entirely live without the use of computers, using only overhead projectors as light source and performance interface. Tonewheels aims to open up the “black box” of electronic music and video by exposing the working processes up close and personal with the audience crowded around the devices. Holzer’s recorded work has been released on the labels Nexsound, Mandorla, Sirr, and/OAR, and Gruenrekorder. Holzer has performed live, taught workshops and created scores of unique instruments and installations since 2002 including at Club Transmediale Festival (Berlin), Elektronmusikstudion EMS/Fylkingen (Stockholm), FACTO Fonoteca National (Mexico City), Norberg Festival, International Symposium of Electronic Art, Rotterdam International Film Festival, WORM, Eye for an Ear Festival (Berlin), Bent Festival (New York), Netmage (Bologna), STEIM (Amsterdam), and Tesla (Berlin). Derek Holzer Workshop: As part of UA#17, Derek Holzer will facilitate SoundBoxes – a two day instrument building, noise making workshop on Saturday 23rd and Sunday 24th May at Apiary Studios. Expanded cinema artist Hangjun Lee and Balloon and Needle noise turntablist Chulki Hong create a brutal state of ruptured perceptions and frenzied cacophony. Their work strips cinema back to it’s primal forces – projection beam, frames, colour, and reconfigures it into an abstract discharge which the sound, played live from an ensemble of turntables and effects, mirrors in it’s harsh intent. Lee and Hong present two live works which bring to the surface the usually submerged aberrations in analogue film-sound technologies. Nebula Rising uses decayed and handmade 35mm film in duo with a blasting noise-track. While The Cracked Share is an experiment in subversive expanded cinema and noise. Hangjun Lee is a filmmaker and independent curator and programmer of Experimental Film and Video Festival in Seoul (EXiS). His works are based on multi-projection and optical sound, often involving improvisations with a variety of artists. He has performed for National Taiwan Museum of Fine Arts (Taiwan), 102 (France), South Bank Centre (UK), Cafe OTO (UK), LUFF (Switzerland), BOZAR (Belgium) and Netmage (Italy) and his films are distributed by Light Cone in Paris (France). He has contributed to several contemporary arts magazines in China, Taiwan and South Korea, and has participated in artist residency programmes at LIFT (Toronto), Nowhere (London), MTK (Grenoble), and MIRE (Nantes). Recent exhibitions include KunstDoc Gallery and Factory Gallery (South Korea), and Christine Park Gallery (London). Chulki Hong is a noise improvisor and label manager of Balloon And Needle, along with Choi Joonyong with whom he also formed Astronoise. Hong plays with feedback and amplification through cracked technologies including turntables, mixers, broken MD players, laptops, and CD players. He has performed in bands including Puredigitalsilence, Automatic Hand-dryer, and Seoul Frequency Group. Hong and Lee released the self published DVD Expanded Celluloid, Extended Phonograph. Ewa Justka is a polish electronic noise artist and instrument builder based in London. Justka’s main field of research is the exploration of the materiality of objects, vibrant, ontological systems (human bodies, plants’ bodies, electronic circuits: micro and macro environments and the relations between them) and an investigation of modes of quasi-direct perception through noise performance actions, interactive installation, DIY electronics, hardware hacking, plant-molesting, breaking, deconstructing and collaborating. In her artistic work Ewa attempts to explore the concept of materiality of the hidden. Optoelectronic Noise Performance is an audio-visual live transmission of erupting current synchronized with fluorescent, throbbing light. The discordant signals generated by the obsolete electronics abruptly invade the body by surrounding it with dissonant frequencies and corrupted hard techno providing a tangible, multi-sensory experience. Justka has performed at Network Music Festival (Birmingham), Supernormal (Oxfordshire), Club Transmediale Festival (Berlin), STEIM (Amsterdam), Colour Out Of Space (Brighton), and at London events Exploding Cinema, BEAM Festival, Cafe Oto, noise=noise, Hight Voltage Noise Disco Corsica Studios, Supreme Ritual Action Noise, and Embodied AudioVisual Interaction. Rose Kallal is a New York based visual and sound artist whose performances combine immersive multiple 16mm film loop projections along with live modular synthesis and percussion elements. Kallal cycles film loops at varying speeds, creating a hypnotic, nonlinear flow of repeating patterns, motifs and animations, sometimes synchronous, sometimes dissonant, that both reflect and shape the constantly shifting, deconstructive and recombinatory nature of her live music. Her experimental sound compositions include the manipulation of modular synthesizers and drum, bringing antiquated tools into a modern perspective: “She revisits the past to modify the present and chart a new future.” – New York Times. Her work has been presented internationally at festivals and galleries including Sonic Acts (Amsterdam), Club Transmediale Festival (Berlin), Participant Inc. (NYC), MoMA PS1 (NYC), Contemporary Museum of Art Bologna (Italy), Spike Island Art Center (Bristol), and Performa (NYC). Kallal has collaborated with sonic luminaries including Robert AA Lowe (Lichens), Joe Denardo (Growing), James Ginzburg (Emptyset), and Mark Pilkington (The Asterism). Kallal is released on UK electronics label We Can Elude Control run by Emptyset’s Paul Purgas.